With Docentric AX Free Edition you can use improved Docentric print destinations including improved Print archive for all built-in SSRS reports. Let’s see this on an example of a plain Non Print Management report: Number of workers. If we start this report in the standard way, by opening the report dialog form with Screen as the target print destination, the report will be generated and open in the built-in SSRS report viewer. The report is generated by SSRS Reporting Services using the built-in SSRS report design (HcmNumberOfWorkersReport.Report). When you open the Print destination settings form from the report dialog form, you should see the Show Docentric destinations button. The Show Docentric destinations button can also be hidden, and that is configured in Docentric AX parameters through the Print destination settings mode field. The Docentric AX parameters form can be open from the Docentric AX workspace or from the Organization administration module menu. 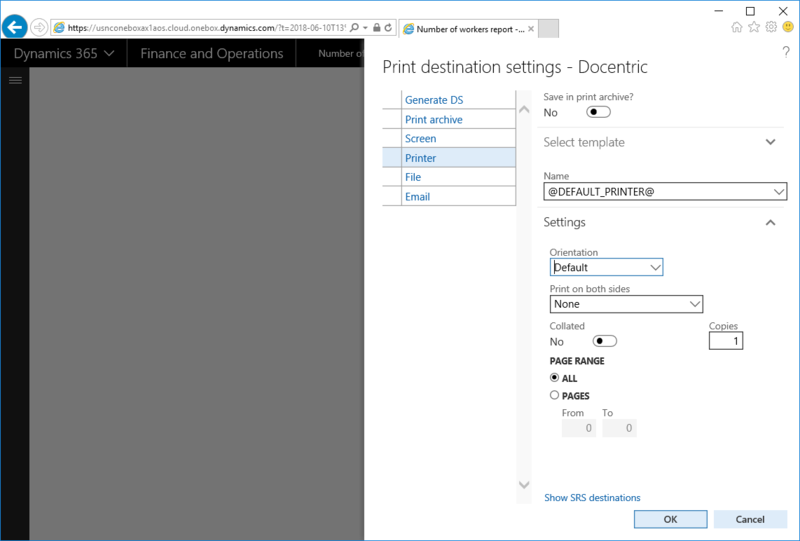 By default Use both SSRS and Docentric print destinations is used, but you can even select the Use only Docentric print destinations value for Print destination settings mode. This is a reasonable thing to do since Docentric print destinations enables all functionalities offered by the built-in SSRS print destinations and much more. If you click the Show Docentric destinations button, Docentric print destinations will be shown. Select Docentric Screen as the target print destination and execute the report. While SQL Server Reporting Services still generates the final report using the built-in SSRS report design, the generated report is now open in Docentric report viewer that is much better than the built-in SSRS report viewer and works also in on-premises environments. Also, if you check Docentric File and Email print destination you will see the new possibilities such as saving report to Azure, SharePoint, Attachments, using HTML email body, placeholders, etc. If you select Docentric Printer print destination you will have the possibility to print to the printer of your choice. In addition to the standard list of available printers there is also the @DEFAULT_PRINTER@ printer name. When it is selected, the default printer for the current user will be used. We can use Docentric placeholders in any of print destination settings where it makes sense, for example in Output filename, Azure blob container, Email addresses, Email body, etc. There are two kinds of Docentric placeholders: Standard and Custom placeholders, and both can be used with Docentric AX Free Edition. Still, in most cases you will probably need to define your own Custom placeholders for a report, e.g. Purchase ID and Vendor contact name for the Purchase order report. In order to do that, you will need to add the SSRS report (design) that you want to define Custom placeholders for to Docentric report setup. Open the Docentric AX workspace from from the Organization administration module menu and click on the Reports tile. The Docentric report setup form is open. Click the New button on the Reports form and locate the HcmNumberOfWorkersReport SSRS report and the Report SSRS report design. Click the OK button. The HcmNumberOfWorkersReport.Report SSRS report design is now registered in Docentric report setup, which enables some advanced configuration regarding print destinations. Of course, Docentric report setup serves to manage many other aspects of registered reports such as Docentric designs (aka Docentric templates), data source generation settings, etc. Notice that the report will not be valid, if the Use only print destinations checkbox is turned off (which it is by default). Validation error that at least one Docentric design (aka Docentric template) is missing will disappear, if you turn on this option and then re-validate report by clicking the Validate button in the main action pane. When a new SSRS report design is registered in Docentric report setup, the Docentric Default DSP class is used. This class is a part of Docentric AX Framework, and enables reusing of the existing SSRS report data sets. To be able to use Custom placeholders in print destinations for this report, you will need a custom DSP class. After the custom DSP class with Custom placeholders is created and compiled, you need to select this class in the DSP (Data source provider) class combo box for the HcmNumberOfWorkersReport.Report report. And next time you open the Print destination settings form for the Number of workers report, all defined Custom placeholders (in addition to Standard placeholders) will be available for use in Email body, Email subject, Output filename, etc. When we print a Non Print Management report such as Number of workers, the Print destination settings forms can be open and we can select one of Docentric print destinations. But what about Copy and Original preview functionality for Print Management reports such as Purchase order and Customer invoice. How we can use Docentric viewer to preview such a report instead of the built-in SSRS report viewer? Similarly as for enabling Custom placeholders, we need to register the wanted Print Management SSRS report design (e.g. PurchPurchaseOrder.Report or SalesInvoice.Report) in Docentric report setup. Although it is not necessary, you can turn off the Use only print destinations option in the General tab page to avoid the Invalid status of the report. This flag actually doesn’t have any other purpose. After that, click on the Preview setting button in the Settings action pane tab. The Preview settings form is open. On this form the Use only Docentric viewer checkbox should be turned on (by default, when a report is inserted, the both checkboxes are turned on). When you preview the Purchase order report from the Purchase order confirmations form by using the Copy or Original preview buttons, the original built-in Purchase order report is generated by SQL Server Reporting Services but it is open in Docentric viewer. If we want to use the Use print management button, all we should do is to select the wanted Docentric print destination as the target destination in Print Management Setup for Purchase order. View executed reports’ print destination settings, e.g. an email message sent to a customer primary contact. Use dynamic placeholders to control what is written into the Description field; the Type field in the grid is hidden. Bring relations to a source table (e.g. sales/purchase order), a journal table (e.g. invoice journal), a customer or vendor, etc. Search by report name, document ID (e.g. Invoice ID), source table ID (e.g. Sales/Purchase ID), Customer/Vendor account number, etc. You can also navigate to these entities by clicking the related fields in the form. Starting from the version 3.3.0 you can change or even make Report caption dynamic by using placeholders in Docentric report setup. You will find the Report caption field in the General tab in Docentric report setup for a currently selected report. You can programmatically change all print destination settings to achieve various dynamic scenarios. For example, you can change the target print destination under certain conditions, e.g. from Screen to File, or to add additional attachments to the same email that the generated report is going to be attached to. To accomplish this, you have to register the wanted SSRS report design in Docentric report setup, and then to create a custom DSP class in the same way as you would for managing Custom placeholders. You can improve not just report viewer but also an SSRS report design by replacing it with a Docentric design (aka Docentric template). Docentric designs (templates) are just ordinary Word documents designed directly in MS Word with the help of Docentric AX Designer. Design process becomes far more simple and straightforward, and results in much more appealing documents. You can even have multiple Docentric templates per one SSRS report design. On the Print destination settings form you can then select between them including the built-in SSRS report design. Thus, if you are using the full product version, and the Use both Docentric design and viewer checkbox on the Preview settings form is turned on, when you preview the report (by using Original or Copy preview), Docentric viewer and a Docentric template will be used. The full product version is not just about better and end-user friendly designer. You will also benefit from the powerful Report Data Preparation framework.